Common Harvest Farm - What does a farm share cost? Our regular season share is delivered in a ¾ bushel box which is typically enough to feed a household of four to five people. Our delivery season begins in early to mid-June and averages 19 weeks ending in the middle of October. 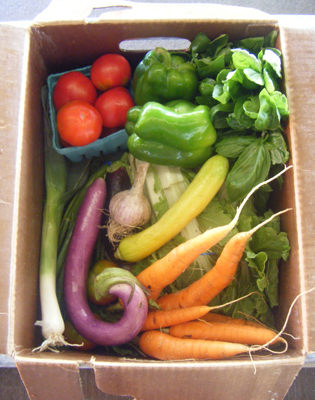 Variety is the hallmark of a balanced CSA box. We harvest between 10 and 12 different items for each box. See the accompanying chart for a more complete listing of what to expect throughout the season. In addition to the regular share, members also have an opportunity to purchase a fruit share and extended season share. Download and printout a contract form. We offer a limited number of stand alone half shares. These are packed in our regular ¾ bushel box and delivered every other week. Download and printout a contract form. The upper Midwest in not known for a wide offering of fruit. As a result, we work with friend and former CSA farmer, Everett Meyer through www.Fruitshare.com. Everett has an eye for quality and he has assembled a network of small, organic fruit growers from around the country who pick and pack the highest quality fruit. 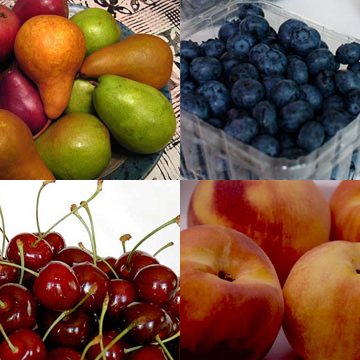 Our fruit share consists of four deliveries: 12 pints of Blueberries in late June, 6-8 lbs. of Cherries in July, 9 lbs. of Peaches in late August and a Pears/Apple mix in late September.Download and printout a contract form. 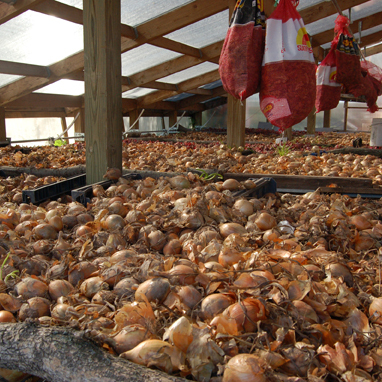 In 2008 we built a root cellar to properly store root crops for an extended season share. Our late season share is delivered in two installments: One in the middle of November and the second in the middle of December. Each delivery will include a bountiful mix of carrots, potatoes, beets, onions, cabbage, and winter squash. Our members have reported eating from these larger boxes well into the winter. Download and printout a contract form.